Our Easy Peach Parfait with Brown Butter Granola, Roasted Pecans, and Cranberries. I was having a major craving for fresh peaches in the dead of winter here (in Florida), fortunately, we had a stash in the deep freeze from this past season. If you’re on the hunt for peaches out of season, grab a bag of frozen. Frozen peaches are picked, peeled and cored at their peak. And a frozen peach offers as many nutrients as its fresh counterpart plus it’s ready to cook at a moments notice. They’re a staple in our kitchen year-round for topping oatmeal, ice cream, granola, or adding to smoothies and baked goods too. Canned peaches have already been cooked, even if they have been raw packed. Although we’ve had some amazing home-canned peaches, and they certainly have their place in the kitchen. But, frozen is our preferred choice if we can’t get our hands on ripe juicy peaches in January. All they need is a bit of time to defrost,and since you don’t have to worry about peeling them they are super convenient to use in any recipe! Our easy peach parfait is great for breakfast or a snack on the go, we paired it with our popular Brown Butter Granola. Making it the perfect sweet, salty, crunchy bite! If you aren’t familiar with the magic of Brown Butter then be sure to read up on it here. It’s nutty caramely flavor is a secret weapon in the kitchen adding flavor to everything from sauces, baked goods, eggs, soups, fish and so much more! This easy peach parfait is great for breakfast or a snack on the go, we paired it with our popular Brown Butter Granola. It's the perfect mouthful of sweet and salty with a crispy crunchy texture. Preheat the oven to 425°F/218°C In a medium bowl toss the peaches with brown sugar and cinnamon and arrange them in a single layer in an oven proof pan. Bake for 8 minutes, then turn the broiler on and brown for an additional 2 minutes. Remove from the oven and cool for 5 minutes. Layer yogurt, granola, browned peaches, and pomegranate seeds until 2-3 layers have been created in each glass. 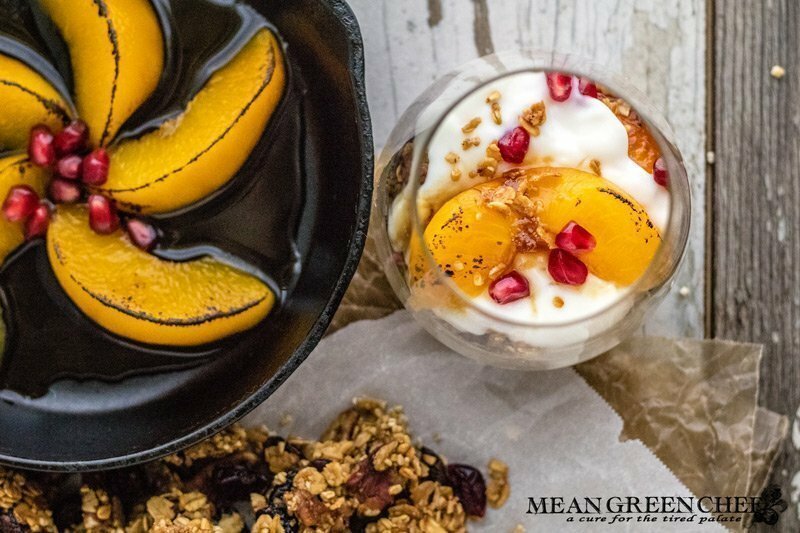 Top with peaches a sprinkle of granola, and pomegranate seeds. Serve immediately or chill up to 4 hours before serving. Be sure to check out our other great breakfast ideas!